Welcome to the House Mouse and Friends Monday Challenge #91. 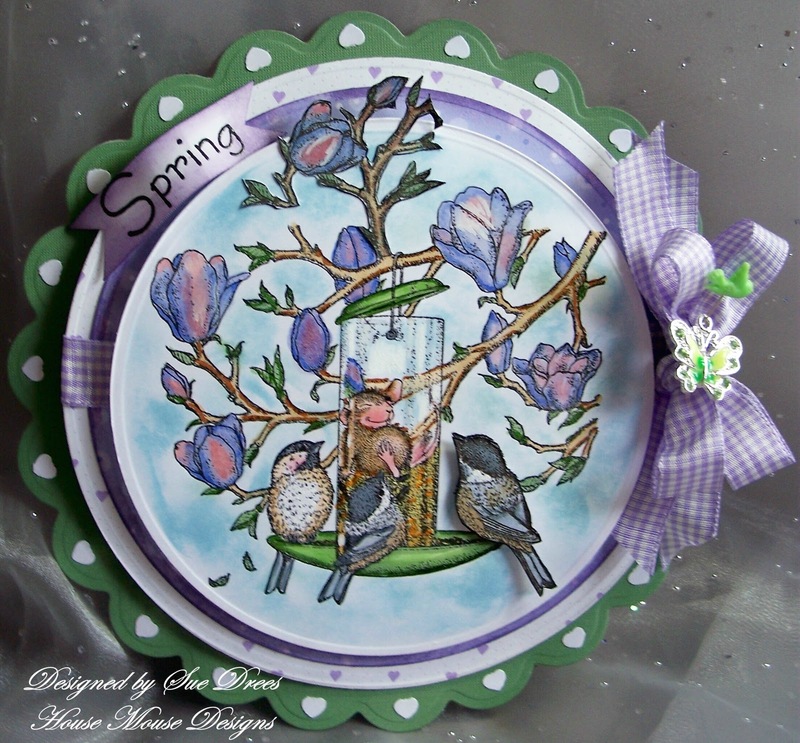 The theme for the challenge is "Spring Time" chosen by our fabulously talented teammate, Mary! Mary is taking some time to make a big move right now and we wish her well. We are also welcoming two new Guest Design Team Members for the month of March. Welcome ladies, we are very excited to have you designing with us, and can't wait to see what you come up with. Our sponsor this challenge is Simon Says Stamp and the prize is a $ 15 gift card for a shopping spree at their online store. What says Spring more than the birds returning? Well look what they found "fat and happy" inside their bird feeder! Is this image too cute? I made a circle card using my new Grand Nestibilitiies on my new Grand Calibre machine from Spellbinders. Colored the scene with Copics, cut one bird out and raised him up. Sponged the background. Punched little hearts to fit into the scallops around the edge of the main card. Added a butterfly charm and a little bird stick pin. Hope you have time to visit us at House Mouse and Friends Monday Challenge to see the beautiful design team creations, you won't be disappointed! you and see what you have created. Wonderful!! 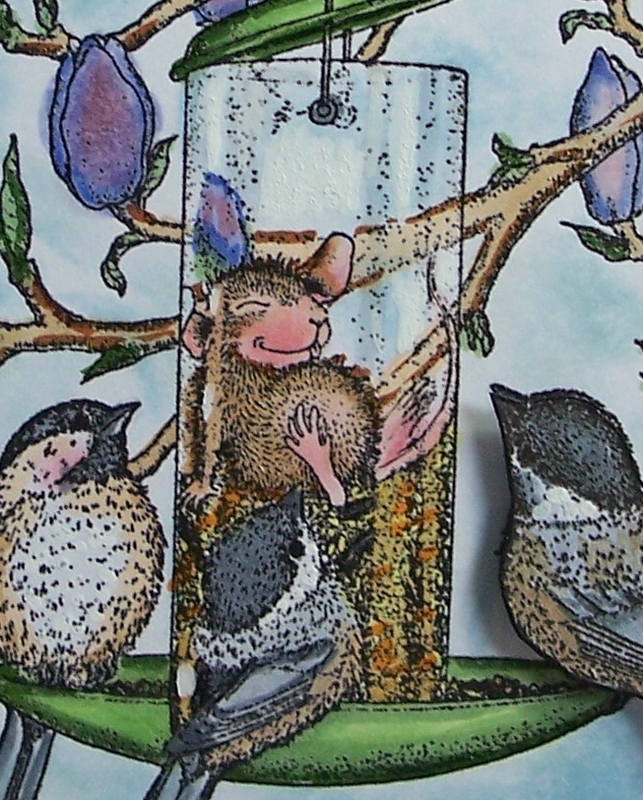 I love this House Mouse image and your use of the grand calibre to create this gorgeous round card is spectacular. Your Card is the best!!! Oh wow Sue! This is my all time favourite HM stamp - and the first one I bought! I love how you've made your card! Stunning! 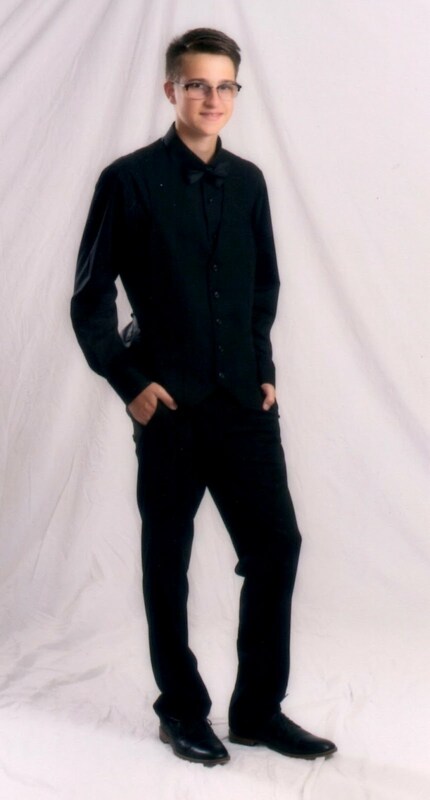 Oh my gosh - this is an image I've never seen! How cute is that! Love your card, Sue - as always, your coloring is wonderful!!! Have a good day! Hee hee This is totally CUTE. Those birds are thinking what are you doing??? LOL Awesome coloring Sue, the circle shape is a fabulous touch. Beautiful and adorable all in one. Stunning Spring creation Sue great shaped card & this image just cracks me up..love your image colouring..
ps LOVE your awesome piccys of Niagara falls..
very lovely card sue and the image is very cute. What a sweet image! And such a beautiful card! Beautiful card, love the colouring and all the detail. This is so cute, Sue! I haven't seen this image yet! I love this round card! OH SUE - this has to be one of my FAVOURITE HM images - I LOVE the way you've popped the bird up - just a stunning layout! hi sue, love your card it is sooo cute, do you know the name of the stamp that you have used, i need to buy it!!! hi sue, thanks for your comment and your reply about the stamp, i have just ordered it on line and cant wait for it to come, all due to your fantastic inspirational card!! Absolutely beautiful Sue, love the design, your fabulous colours and your colouring of that gorgeous image is simply perfect!!! Sue, Sue, Sue -- what you can do with one little stamp and an enormous amount of talent and creativity. Adorable. Wow - what an amazing card - your colouring is fabulous. The image is soooo cute and I love the circular design. Fabulous work. Lovely image and great shaped card.